Chances are, if you were to pull out your latest pay stub, you would see two important lines among the list of taxes taken out of your wages: FICA and MEDFICA. If you were to do the math, these two lines, standing for Federal Insurance Contributions Act and Medicare Federal Insurance Contributions Act respectively, take up 7.65 percent of your wages. However, when it comes to these payroll taxes, as they are commonly known, there is a lot more than meets the eye. In two separate blog posts, we will dive into several important issues: what payroll taxes are exactly, who pays them, how effective they are, and some of the controversy that surrounds them. This blog post covers the first two topics, while the next will cover the latter two. Put simply, payroll taxes are taxes paid on the wages and salaries of employees. These taxes are used to finance social insurance programs, such as Social Security and Medicare. According to a recent Tax Foundation paper, Sources of Government Revenue in the OECD, 2016, these social insurance taxes make up 24.2 percent of combined federal, state, and local government revenue – the second largest source of government revenue in the United States. The largest of these social insurance taxes are the two federal payroll taxes, which show up as FICA and MEDFICA on your pay stub. The first is a 12.4 percent tax to fund Social Security, and the second is a 2.9 percent tax to fund Medicare, for a combined rate of 15.3 percent. Half of payroll taxes (7.65 percent) are remitted directly by employers, while the other half (7.65 percent) are taken out of workers’ paychecks. Who Really Pays Payroll Taxes? Perhaps one of the best-kept secrets of payroll taxes is that employees effectively pay almost the entire payroll tax, instead of splitting the burden with their employers. This is because tax incidence is not determined by law, but by markets. In fact, the person who is required to pay a tax to the federal government is often different than the person who bears the tax burden. Usually, the marketplace decides how the tax burden is divided between buyers and sellers, based on which party is more sensitive to changes in prices (economists call this “relative price elasticities”). It turns out that the supply of labor – that is, workers’ willingness to work – is much less sensitive to taxes than the demand for labor – or employers’ willingness to hire. This is because workers who need a job are not as responsive to changes in wages, but businesses are able to “shop around” for the best workers or shift production to different locations. 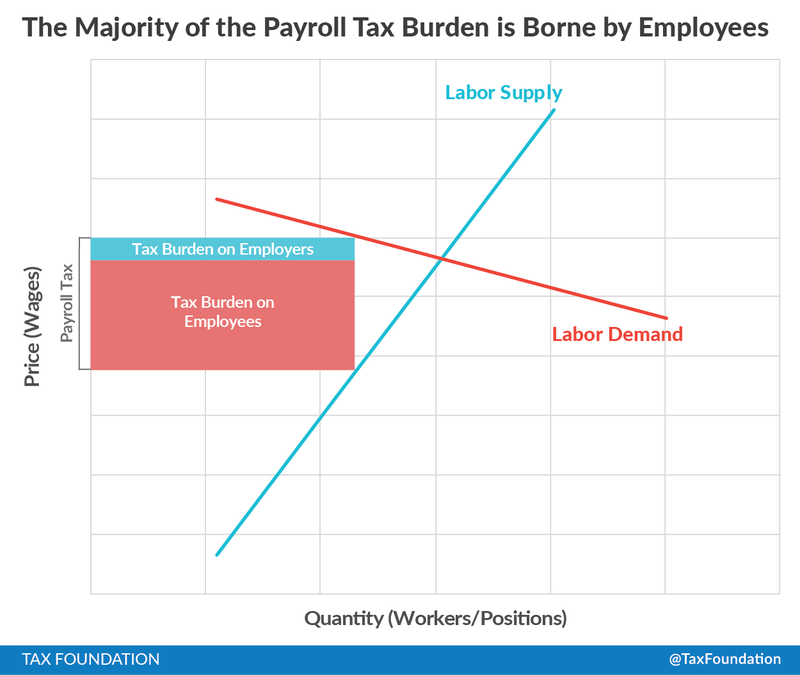 The graph below roughly illustrates how the labor market distributes the payroll tax burden. The fact that the labor supply line is steeper than the labor demand line is a way of showing that workers are less sensitive to changes in wages than employers. Besides the fact that the federal government’s imposition of “employer-side” payroll taxes is misleading, it also leads to a possible problem: it masks the costs of the programs that payroll taxes pay for. That is, rather than directly listing the ordinary taxpayers’ share of payments for Social Security and Medicare, half of the taxes that fund the programs are hidden from workers, in the form of lower wages. This is an issue because it violates the principle of tax transparency: a tenet that states that tax burdens should not be hidden from taxpayers in complex structures. Because roughly half of the payroll taxes that fund Social Security and Medicare are hidden in the form of lower wages, rather than being entirely spelled out on our pay stubs, voters may underestimate the true budgetary impact of these social programs. In summary, payroll taxes are a significant source of government revenue, but the burden of the payroll tax and the government programs they pay for may not be entirely apparent to taxpayers, due to how the taxes are levied. In the next blog post on this topic, we will cover how effective these taxes are, as well as other potential issues they may have.